Explore Madeira's best known sights and learn why it's known as 'the pearl of the Atlantic' with its dramatic mountainous scenery criss-crossed by levadas and colourful flora. This highlights trip is based in the coastal city of Funchal and has a mix of full and free days. Arrive Funchal and check-in to the hotel that will be our base for the next seven nights from which we will explore Madeira's highlights. Funchal takes its name from 'funcho', meaning fennel and according to local legend, when Zarco landed here in 1419, he named this spot after the abundance of the herb he found. Visiting sailors used to call the city 'Little Lisbon' because of the grandeur of its cathedral and the buildings that line its harbour that reminded them of those in Lisbon. Today we leave Funchal on a full day tour of the north and north-west of the island including Camara de Lobos, where we see a plaque dedicated to Sir Winston Churchill who used to holiday on the island and would sit at this spot to paint the beautiful coastline scene. We continue to Pico da Torre viewpoint, which offers stunning views of the traditional buildings in Camara de Lobos lining the bay. The 360 degree panoramic views stretch back as far as Funchal. Our next stop is Cabo Girao, which is second highest cliff face in the world and offers yet more captivating sea views. We continue through Ribeira Brava and into the mountains to Encumeada. From here there's the chance to take an easy 3 kilometre walk along Levada Folhadal. Madeira's levadas are a unique series of mini-canals used for irrigation. There are a number of great walking trails on the island that follow these channels. After our walk we journey down through the forested area of Chao dos Louros to the pretty town of Sao Vicente on the north coast. Lastly we'll stop to see Pousada dos Vinhaticos, a heritage hotel, which is the last remaining pousada on the island, before heading back to Funchal for the evening. This morning we go on a walking tour of the island's capital Funchal. We'll see Mercado dos Lavradores - a fascinating fruit market where every fruit and vegetable imaginable offers a huge array of colours and sweet smells. Another market well worth seeing is the fish market where the fresh catches of day will be on sale. Next we head for Bordal Embroidery Factory, which produces some of the finest traditional embroidery and tapestries to be found on the island. After time to look around we continue into the historic centre of Funchal's Old Town, where you can find a large selection of restaurants and bars and also a permanent outdoor art gallery displaying over 200 works of art by guest artists that are painted onto the doors of Rua de Santa Maria. We'll also have the opportunity to admire the colonial architecture outside Santiago Fort, the Regional Government Palace and the fort and palace of Sao Lourenco. We'll visit the Municipal Theater and Jardim Municipal - the large garden here is sure to enchant you with its collection of alluring exotic flowers, both endemic and from around the world, and its native ancient trees. After a morning of exploration we have time to relax and soak up the history at Reid's Hotel, where Churchill used to stay in 1950's, and where we'll partake in afternoon tea before returning to our hotel in the late afternoon. For the afternoon tea please wear smart casual clothing and avoid wearing shorts or sportswear, such as trainers. This morning en route to Ribeira Brava we will visit the Ethnographic Museum. The museum holds a collection of objects relating to Madeira's culture and traditions such as wine, fishing, transport and much more. After time to explore the museum we drive on to Calheta to visit one of the last working sugar mills on the island dating back to the 16th century. We'll learn of the 'white gold' and rum making history of the area and have a tasting of the popular local drink 'Poncha', which is made from lemons, honey and rum and also sample honey cake. If you're lucky enough to be here between April and mid-May then we should be able to see the mill working, as it'll be sugar harvesting season and production will be in full swing. Next we'll head for Prazeres, which is small parish not far from Calheta. Here there is the opportunity to take an easy barefoot walk along an 800 metre path, which is made up of 17 different items sourced from the island including pine, eucalyptus berry, laurel, beach pebbles, black and yellow sand, gravel and mud. It's designed to provide natural reflexology for your feet and offers a completely different sensory experience. Before returning to Funchal we'll make a stop in Jardim do Mar, a beautiful spot between the sea and the mountains. This small parish preserves the calm of days gone by with its narrow streets and low level houses with beautiful gardens. You'll have free time here for lunch. This afternoon we head for Blandy's Wine Lodge where we enjoy a premium tour and tasting. The tour will explain the full wine making process from the making of the barrels through to the production and storage of the finished product. Followed by a tasting of, what it arguably the island's most famous export, Madeira wine. Today has been left free for you to further explore Funchal or there'll be the chance to go on a full day excursion to the island of Porto Santo by ferry. The journey takes approximately two and half hours each way. Porto Santo is a popular beach destination with the locals and with its 9 kilometre unspoilt white sand beach stretching all the way from Vila Baleira to Ponta de Calheta it's easy to understand why. Whilst on the island you may also choose to visit the Columbus House Museum, which is the former home of the legendary explorer Christopher Columbus. Today we'll travel by boat out to the Desertas Islands and we'll hopefully get to see dolphins and whales along the way. Our boat will be 'Bonita da Madeira', a 23 metre long wooden sailing boat. 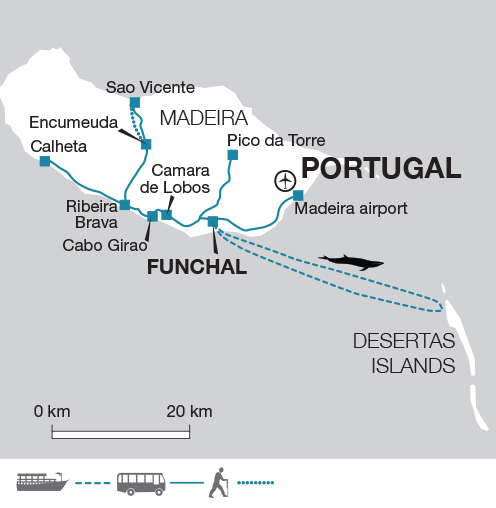 The Desertas Islands are a group of 3 uninhabited islands, which lie around 25 kilometres off the coast of Madeira. They have been dedicated as a Natural Reserve to protect the rare species of monk seal, monachus monachus, which favours them. Our boat will anchor at Doca where you'll have time to swim in the clear waters and relax in the secluded bay. After lunch on the shore we'll then begin our journey back to the mainland. Please note that in the event of poor weather it may be necessary to cancel this boat trip or change the day of operation. If the boat trip isn't possible to do during your stay then we'll enjoy an excursion to Pico do Arieiro and Santana on the east of the island instead. Today is free for you to do as much or little as you may like. For those who what something more activite then there's the chance to walk to Caldeirao Verde Waterfall. Starting at the Queimadas Guesthouse and walking along the Levada of Caldeirao Verde, we make our way westwards through an emerald green paradise. Soon after the start we see the most spectacular views of the villages far below. Walking further then a waterfall comes into view and soon after passing it, we go through some short tunnels and after a while we arrive at Caldeirao Verde majestic waterfall. Following a short rest, during which we have our picnic, we begin the return journey. This is a highly recommended walk to some of the most remote and beautiful parts of the island. If you're looking to take things at a more relaxed pace then you may wish to take the cable car to Monte or to the Monte Botanical Gardens. The cable car to Monte takes approximately 15 minutes and then to the gardens it's a further nine minutes each way. The gardens have been open since the 1960's and are one of Madeira's best known tourist attractions. The huge gardens display over 2500 exotic plants that provide an exuberance of colour and scents. You may decide to return from Monte to Livremento in Funchal (around 15 minutes walk from our hotel) by a ride on a traditional wicker toboggan. The downhill journey takes about 10 minutes along a 2km long road course. The toboggan will be steered by two operators and can reach up to 48kms per hour. For those looking for the best of both worlds there'll be the chance to join a half day excursion to Quinta Palheiro Gardens with a moderate levada walk at Vale Paraiso. These gardens showcase a variety of plants in a beautiful setting in the hills to the east of Funchal. The trip ends at our hotel in Funchal after breakfast. Eastern Island Tour Pico do Areeiroantana (full day) - €36.00 per person, + lunch - €13.00 per person. July and August are the warmest months, though the islands are freshened by cooling sea breezes. Waterproofs are essential at any time of the year, as are gloves, a hat and a warm jacket, jumper or fleece for higher altitudes and evenings. We also recommend taking a swimsuit. Comfortable walking shoes and trainers or sandals for relaxing. Plastic sandals are useful if swimming off lava rocks. One main piece of baggage and a day pack for personal items. Remember you are expected to carry your own luggage - so don't overload yourself. We recommend taking a waterbottle, sunhat, sunscreen, sunglasses, torch and towel for swimming. During the included boat trip to the Desertas Islands sometimes there can be some wave motion onboard, so If you suffer with sea sickness then please consider bringing anti-sickness medication with you. On this centre based holiday our hotel is central located within Funchal city centre and is around 10 minutes' walk from the beach and 5 minutes from the Old Town. It's a recently renovated 4 star hotel. Facilities include a bar, rooftop outdoor swimming pool, restaurant and a laundry service (additional charges apply). Bedrooms have modern decor in neutral colours and each has cable television, mini bar, telephone, hairdryer, Wi-Fi (additional charges apply) and a safety deposit box (additional charges apply). All rooms are en suite and most have a shower over bath. Bedrooms do not have air-conditioning. Portugal: Visas are not required by UK, Australian, New Zealand, US and Canadian citizens. Other nationalities should consult their local embassy or consular office.